Our family goes through a lot of milk, cereal, bread, eggs and diapers. A lot of diapers. It seems that except for a few short months here and there, we always have someone in diapers. Which means I am always looking for ways to save money on them. I approached my husband about using cloth diapers once (to save money). His response, "...not if you ever want ME to change a diaper. " Needless to say we will remain a disposable family because I really appreciate his willingness to help. Although I have tried every diaper on the market, we always go back to the same ones that we have been using for over 10 years. But,... always open to saving money, I was excited to try the new Kidget Diapers from Family Dollar. I didn't know Family Dollar had their own line of diapers and wipes? I was really worried at first. Afraid Kidgets wouldn't provide the "support" I had come to expect from our brand name favorite. Boy was I surprised. 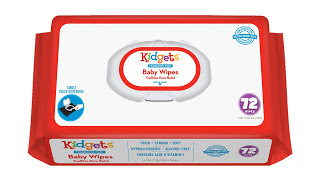 The Kidget diapers are really soft, DON'T leak, and the tabs stay put. I mean they really really stay in place. They are less expensive than the brand name I have been buying. And to be honest, they are just as good. The Jumbo pack of size 4 diapers were $6.75 for 27 diapers. I usually pay closer to $9.50 for the name brand diapers at the grocery store. (And there isn't 27 in a pack). The wipes were also very impressive. They are thick, soft and strong. There are three layers and they don't tear. In fact, for most diaper changes, one wipe did the job. They come in unscented and fresh scent. As silly as this may sound, one of my favorite things about the wipes are the container they come in. You push a little lever to open the package. Easy to open with one hand. Because the other hand is usually holding little legs. I love being exposed to new products that are great, and I appreciate the opportunity to share them with you. Especially when saving money doesn't mean we have to sacrifice quality. Thanks to Family Dollar and the new Kidget line of diapers and wipes, we can all save. Do you use cloth diapers? How does your significant other feel about that? Have you ever tried Kidgets?